1.) First measure the distance from Light unit to end of cable or cables. 2.) Decide the Brand, Stranded or Solid, Solid is better for Straight or gentile curves. Stranded is better for tight turns and longer runs. 3.) Order Light unit appropriate to light length, remember that all light units hold only 500 fibers so divide that by the number by the number of fibers in a cable to get the number of cables a unit will hold i.e: SG50 = 500 % 50 = 10 cables. 4.) Select tracing or P-Clips to hold cable in place. The following cable is know as Sideglow â Solid cable. It is a safe alternative to neon, underwater, and above ground applications. 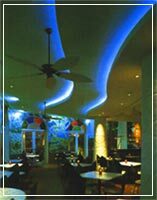 It is ideal for projects in need of color changing lines. It carries no heat or electricity so you by-pass any restriction that normal Light-bulb applications would cause you! The cable can withstand extreme cold conditions so it makes the perfect solution for landscaping needs. (See specs on main menu) The exterior jacket comes in outside or inside type cable. The UV protected style has a PVC and Teflon jacket over the center core to protect from weather or sunlight and is also treated against algaecide and fungus to protect you from the elements. The Sideglow cables can take up to 4-5 years in an outside application before UV deterioration takes place. Solid Sideglow® Cable is a solid plastic core with a thin cladding to reflect light along its side. It will not match Neon brightness, but is dam close! You be the Judge! We recommend that you purchase a 50' or less run and a FOP150 or SOLAR FLARE light unit to test brightness before ordering a larger amount! We recommend the you use a Sharp Razor Blade for terminating the cable in the connector when using the Solid Sideglow. IF RUNNING longer then 50 ft and you are not lopping back the end, then ORDER the Stranded Sideglow cable. Please order the Hot Knife when terminating the STRANDED cable only! A correct and clean cut will make the difference between a 20 to 50% gain or loss in light. !!! For Cove Lighting we recommend Solid SG14 or SG10 cables. This is intended for Dim to evening lighting settings. Proper alignment in the connector will mean the difference of 10 to 30 % light loss if done wrong! Paint Cove area white for proper reflection of light. See Return Policy on Sideglow and on Sideglow and Specs on other fiber cables. NOTE: The Solid cables can only be sold up to 100 ft lengths, if you need longer then order Stranded Cable ! Once CABLE IS CUT YOU OWN IT !! Prices drop with volume purchase!! 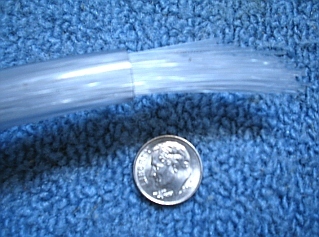 The following cable consist of a .75mm fiber in a clear Vinyl jacket. We here at Fiber Optic Products sell only plastic fiber available in End-emitting and Side-emitting cable, in your choice of solid core or stranded. Plastic fiber can be measured, field cut and bundled on-site, Unlike glass fibers which need more tools and understanding of splicing. This flexibility of plastic fibers allows for lead times that are not possible with glass fiber. An appropriate Fiber Optic Products cutting tool is recommended for use with all plastic fiber installations to maintain warranty coverage. The Endglow and Sideglow cable fiber sold by Fiber Optic Products are an industrial grade solid core and stranded type fiber. We pick only the best manufacturers of optical fiber around the world. Sideglow & Endglow cables are sheathed with a protective jacketing which has a UV Stabilizer, Fungicide, & Algaside, protection to the Jacket. Side emitting plastic fiber is clear cable sheathed with a thin skin allowing light to permit continuous side glow along its length. 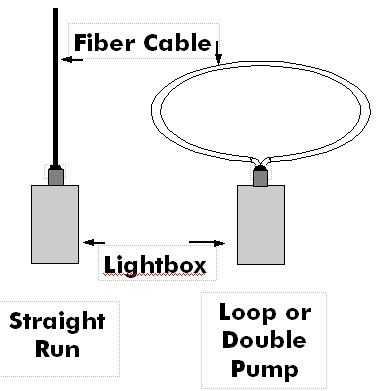 You can achieve more light from a sideglow cable if double pumped, or looped back to the light source. A single run can light 80-100 ft one way with a Stranded core, Solid up to 50-80 ft. In SOME Cases. Caution: When cutting plastic fiber, take care not to mar the ends of the fiber. The installation of plastic fiber needs to be done correctly for proper light out-put. The fiber must remain clean and free of dust and debris on the construction site. You MUST Re-Check the cable and Connector 6-8 month after installation to make sure the cables are not melting or have browned up due to dirt or improperly vented light units.You MUST Re-Check the cable and Connector 6-8 month after installation to make sure the cables are not melting or have browned up due to dirt or improperly vented light units. Sideglow Cable will not light up with standard lighting, it is recommended to use at least 100 Watts Halogen or BETTER. Our 150-Watt Metal Halide light source IS RECOMMENDED for Sideglow Cable. NO Guarantee will be given in projects due to mis instalation by customer or not listening to us when we dicripe correct instalation. Now this is how it works, Cable goes into light unit, Light goes though color wheel in light unit, light goes into cable, cable lights up !!! Do you GET IT ?? You Need a Light unit to light the cable, this IS NOT Rope lighting !! You can Go for an End or Straight Run. or for a brighter output try the Loop back or Double pump system. Only use this if you are close enough to bring the cable back to the connector. This only works with stranded and up to SGS10 Solid core cables. CAN I SEPARATE THE FIBERS AND WILL THEY GLOW ? NO, SEPARATE FIBERS WILL GLOW BUT ONLY FOR A SHORT DISTANCE ! The cable or fibers are inserted into the port opening of the illuminator or FTC connector. The coupler is an innovative, custom machined, aluminum or PVC component which accepts plastic fiber directly, transitioning heat through and out its machined body without the need of intermediate glass fiber. 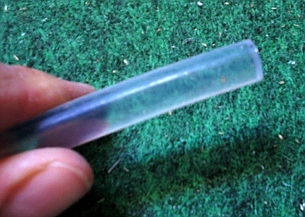 The other end of the fiber or cable is then to retain the plastic fibers in position to receive the concentrated light – less heat – from the illuminator lamp source. Caution: Plastic fiber can be subject to degradation from illuminator heat, which causes the fiber to discolor with operation. Allow extra cable or fibers for trimming in the future. There is no end to the application with Sideglow! Copyright © 1998-2017 Fiber Optic Products, Inc.